We have our big Shipyard Labor Day party coming up and I needed to get a few more fillets for the grill so I headed out on a solo trip from 5-8 pm last night. It was a windy bouncy evening on the lake and mostly trolled S and N. I ended 3-4 with a 10, 12, and 16 lb king and the big fish tested my driving, fishing, and netting all-in-one capabilities. Disappointingly, the one that got away broke the backing line behind the full core. It was probably the biggest yet as it was ripping the line off the reel - where the backing line broke probably hadn't seen the light of day in quite some time. I was mostly in 95-110 feet of water. The 16 pounder came on a meet rig 70 down. The other 2 were on a full core with a greasy chicken wing spoon. They fish provided some great fillets for the grill on Sunday! Mark and I are going out for trip tonight too...details to come. I took an afternoon trip on Sunday (I'm a sucker for a calm, sunny day on the water), so I was expecting slow fishing, and unfortunately that is what I got. I ended up 1 for 2 and caught a 6 lb King on Green dolphin glow on a full core. But, it was a beautiful day! Don from Z-31 was out Sunday Night and reported that he went 3 for 3. He brought in Two mature female Chinooks and nice steelhead. 40 to 50 foot down in 150 foot of water. Green Dolphin and that hammered gold and green with the fluorescent tape. 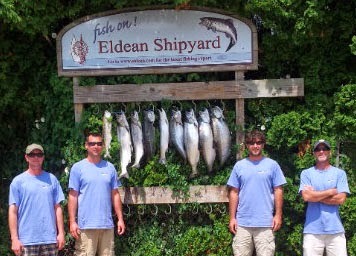 The Eldean Shipyard Fishing Team (Wade, Mark K, Mark V, Paul, Ken, Shane) helped sponsor and also entered the Big Red Classic this past weekend. Leading up to the tournament, the Rhino was out of the water for 10 days getting the hull patched from a freak anchor incident. The boat made it back in the water on Friday afternoon just in time for the tournament. We had an awful Saturday, with only one small lake trout, just big enough to keep. It wouldn't have been so bad if we could could have hooked some of the other 8 or 9 hits that got away. All the misses came in 80 to 180 FOW just North of Holland. For Day 2, I got a tip from Jeff at the marina (Z-39) that he did pretty well down by Saugatuck so on Sunday we went strait to Saugatuck and set up in about 60 FOW. We stayed South of Saugatuck all morning and mostly around 100 FOW. We had action all morning long and ended the day going 9 for 12 with 7 kings, 1 laker, and 1 steelhead. The kings we got early had some nice weight and we were able to weight in our top 5 fish that totaled 67 lbs. Meat rigs behind dipsy and paddles took 3 fish. 1 fly took another, and a variety of spoons got the rest. Sunday was a lot more fun than Saturday and the fishing team is hoping that we can string 2 good days together next year! There were storms in the distance and 2-4 foot waves, but it ended up to be a good fishing trip last night. Paul and I fished from 6:30 to 9 pm in 100 to 135 FOW and ended 3 of 4, with some nice fish! 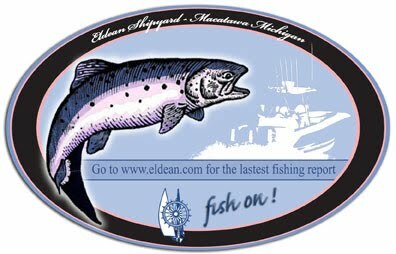 We took a 12 lb steelhead 55 down on a bloody nose magnum. Then a nice 15 king on full lead core with Green Dolphin Glow. The last fish, a 10 lb king came on a slider with a small orange and green spoon. We didn't run any flies or dypsies. Paul and I fished from 7 to 9:30 on Saturday night in 80 to 120 FOW and ended 2 for 4. A 7 lb steelhead on full core came on a green, silver, and orange pro-king spoon. Then a 6 lb king on full core on a greasy chicken wing. Only 2 other boats on the water but it was a little bouncy and raining. Not much fishing info to report on my trip last night with Dan and Terri last night. We ended 1 of 1 and took a nice 5 lb Coho. It was a perfect night on the water. It was warm, calm, and sunny. We only saw 1 other boat out fishing. We were North, South, East, & West and spent most of our time between 60 and 110 and picked up the one fish in 65 FOW on a 8 color lead with a green/silver/orange spoon.